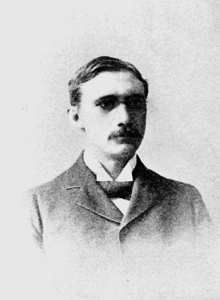 William Francis Magie (1858–1943) was an American physicist, a founder of the American Physical Society (president from 1910–12) and the first professor of physics at Princeton University, where he had graduated (class valedictorian, 1880) and where he served for two decades as dean of the faculty. His papers on the contact angle of liquids and solids and on the specific heat of solutions were notable, as was his text Principles of Physics. ↑ Leitch, Alexander (1978). "Magie, William Francis". A Princeton Companion. Princeton University Press. Retrieved 2008-10-25.